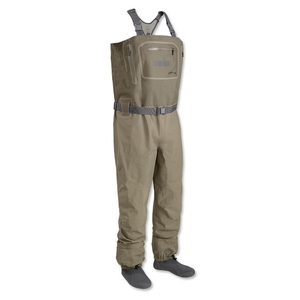 Orvis Silver Sonic Guide Waders. The newest member of the Silver Sonic Wader family is also the toughest and best fly-fishing wader made. Built for the demanding rigors of full-time fishing, the Silver Sonic Guide Waders are designed to keep you dry and last longer than your last three pairs of waders combined. Highly breathable and ultradurable, the Silver Sonic Guides are up to 300% more abrasion resistant and 40% more puncture resistant than the Silver Sonic Convertible Tops. The lower wader features a high-density four-layer breathable nylon, while the upper is the same four-layer nylon used in the Convertible Top lowers. Kangaroo-style handwarmer pocket with YKK water-resistant zippers. External storage pocket with tool dock. Flip-out interior pocket and removable waterproof pocket. Attached self-fabric, reinforced gravel guards with quick-drain panel. Anatomically correct, sculpted neoprene booties. Strategically placed lower leg seams run up the back of the wader, reducing abrasion. Expanded sizes, now including extra long.